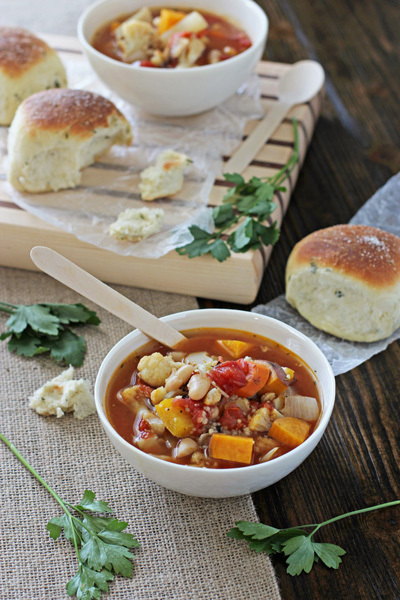 Forgive me for not sharing this soup with you until now. You see, I made it several times during the heat of the summer. But I figured that not all of you are like me and appreciate hot soup during the sticky summer months. So I’ve been sitting on this recipe until now. When it’s at least a little bit more appropriate … since it’s September and all that jazz. Even though it was still close to 90 degrees last week, I just couldn’t wait any longer to share. 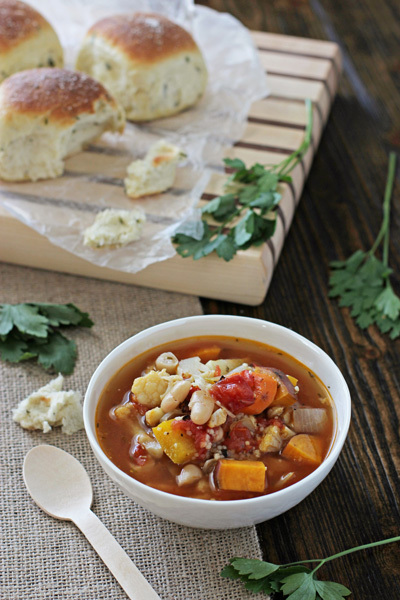 So soup season here on the blog is moving full steam ahead. 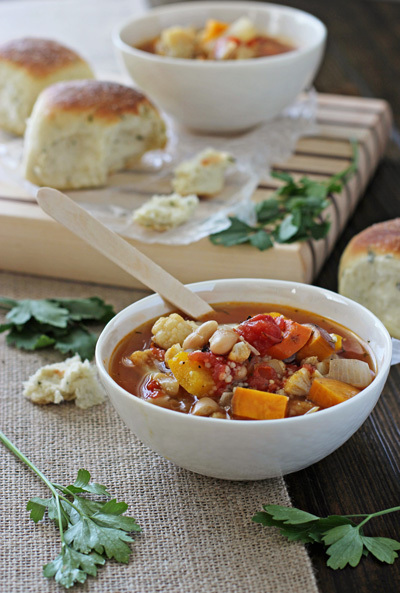 I’m a big fan of veggie based soups and this one is no exception. But my favorite part about this soup is that you roast the vegetables in the oven before adding them to the stockpot. Roasting brings out so much flavor and it really makes this a little special. After roasting, the soup doesn’t take long to come together. Add in some beans for a little protein and some couscous for a little substance, and you are good to go. A healthy and simple meal. An added bonus? It gets better as it sits. Perfect for leftovers or for making ahead. Oh and don’t forget to make some fresh herb dinner rolls to go along with it. The two make for one excellent combination. 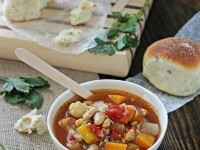 Recipe for roasted vegetable soup with couscous and beans. A simple, healthy meal made special by roasting the veggies before adding them to the soup. Add the onion, carrots, turnip, pepper, sweet potato, cauliflower and garlic to the baking pan. Drizzle with the olive oil and toss to combine. Spread evenly in the pan. Bake for about 30 minutes, stirring once halfway through, until the veggies are tender. Carefully transfer all of the roasted veggies to a large stockpot. Add in the broth, tomatoes (and their juice), salt, pepper, rosemary and thyme. Stir to combine. Turn on the heat to medium high and bring to a simmer. Once simmering, reduce the heat, cover and gently simmer for about 15 minutes. Add in the couscous and beans and cook for another 5 minutes. Serve with chopped parsley and parmesan cheese, if desired. Adapted from Art of the Slow Cooker.